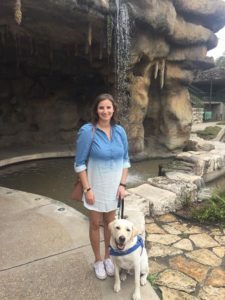 Before moving to San Antonio, I had spent countless hours volunteering my time at a guide dog school in Florida. Guide dog schools are non-profit organizations that typically breed, raise, and train guide dogs to increase mobility and independence to legally blind individuals. 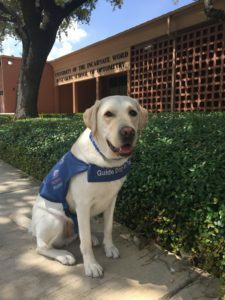 So, it would make sense that when I had accepted a seat in RSO’s class of 2020, my next thought was to locate the closest guide dog school to San Antonio. To my pleasure and surprise, I found one, not only in Texas but headquartered right here, in San Antonio. Prior to leaving my home state I had all paper work filled out, all training quizzes complete, and became an approved volunteer with Guide Dogs of Texas. I was not only excited about starting optometry school but also having the opportunity to give back, to my soon to be neighborhood and community. After several months as a weekend guide dog boarder and getting a handle on my first semester of graduate school, I felt it was time to take the next step. With approval from RSO administration I signed up to become a full-time guide dog raiser, one who boards a dog long-term. 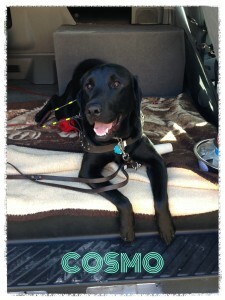 On January 10th, my life changed as soon as I met Grant, my guide dog in training. With his big floppy ears and grinning smile, he instantly stole my heart. As a guide dog raiser, I oversaw exposing Grant to all the sights and sounds he could potentially experience one day while with a client. When I received Grant, I had only lived in San Antonio for six months and was still exploring for myself. What better way to learn a new city than with a puppy by my side? The very first place I went with Grant was the iconic Riverwalk! With water features, ducks, lots of people, and narrow sidewalks it was a great place to begin working on our bond and his training. One week after getting Grant, the spring semester began, which meant all new sights and sounds for him, and for my peers. 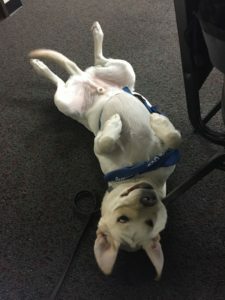 Many classmates had the urge to pet Grant, given his cunning looks, but they understood the damaging effects that occur when a guide dog is distracted from work. Grant quickly discovered his favorite teachers (they were the ones with treats) and would readily interact with them while in the hallways. When I would stay late studying for exams, he would easily cheer me up with a puppy lick or a goofy play session. On June 5th, the big day arrived. After six months of training, he went in for his assessment to see if he could continue as a guide dog. It was a nerve-racking experience, but I knew I had given it my all, and after a few days I found out…HE PASSED! Grant would officially become a guide dog for a legally blind individual. After passing his assessment he had lots of “free runs” at the dog park and maybe a few extra treats. On July 15th, Grant attended his doggy graduation where he traded in his blue “In-Training” vest for his official harness. He will continue in advanced training for six more months and will then be matched with a client. After roughly ten years of working, he will then enjoy the good life of retirement. This whole experience has been so rewarding to me, through the ability to train Grant and help potential visually impaired patients. I highly encourage everyone to find a hobby or organization that you are passionate about and donate your time to it while in school. 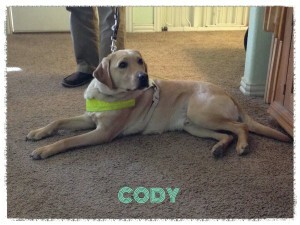 Visit www.guidedogsoftexas.org to learn more, donate, or become a volunteer. The Low Vision and Rehabilitation Club, a student organization at RSO, invited its members to a tour of the Guide Dogs of Texas last week. 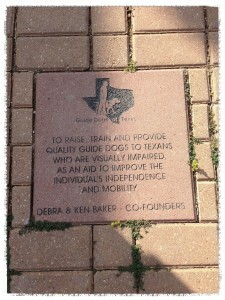 The Guide Dogs of Texas is a not-for-profit organization that provides quality guide dogs to Texans who are visually impaired to increase the client’s freedom, mobility, and independence. During the one-hour tour, we got to hear from three different clients about their visual impairment and success stories with guide dogs, and we also got to meet all of the clients’ guide dogs, including one named Cody. Two staff members and one of the clients, who also served as a volunteer for the organization, gave us a tour of the grounds and facilities. We were able to tour the kennel, which at the moment housed several guide dogs, including Duncan, and tour the residential training facility, where clients stay for a few weeks to receive training with their matched guide dogs. We also got to watch Cosmo, another guide dog, navigate a staff member down a walkway with set obstacles to the staff member’s desired destination, in the same fashion as he would with a client in the client’s daily life. The tour allowed me to learn more about the advantages, requirements, and limitations of having a guide dog. Advantages included increased freedom, mobility, and independence for the client. 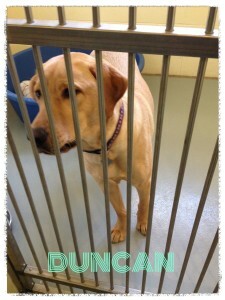 Some requirements included being legally blind and being capable of caring for the guide dog. A limitation was that the client had to know how to get to certain destinations (a client must know how many blocks and in which direction the restaurant is away from home) because guide dogs do not initially know that information. I also learned about several fun volunteer opportunities available with the organization, including puppy raising, puppy sitting, and visiting the kennel to play with the guide dogs, which all sound like dream volunteer opportunities for dog lovers. 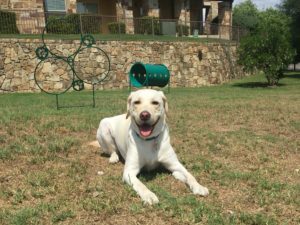 Participate in The Big Give S.A., a 24-hour day of giving, on May 6, 2014 and make a minimum online donation of $10 to Guide Dogs of Texas. 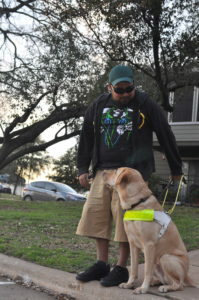 Make an online donation directly on the Guide Dogs of Texas website. Shop online at AmazonSmile, and Amazon will donate 0.5% of the price of your eligible AmazonSmile purchases to Guide Dogs of Texas. 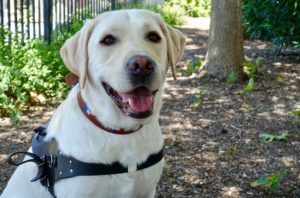 Apply for the Guide Dogs of Texas Capital One Visa Card, and Guide Dogs of Texas will receive $50 after your first purchase, 2% donation on gas and grocery purchases, and 1% donation on all other purchases. 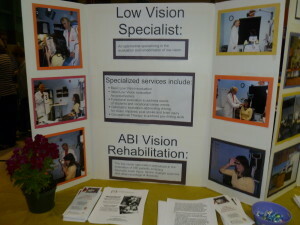 This is my second year volunteering at the Low Vision Expo. 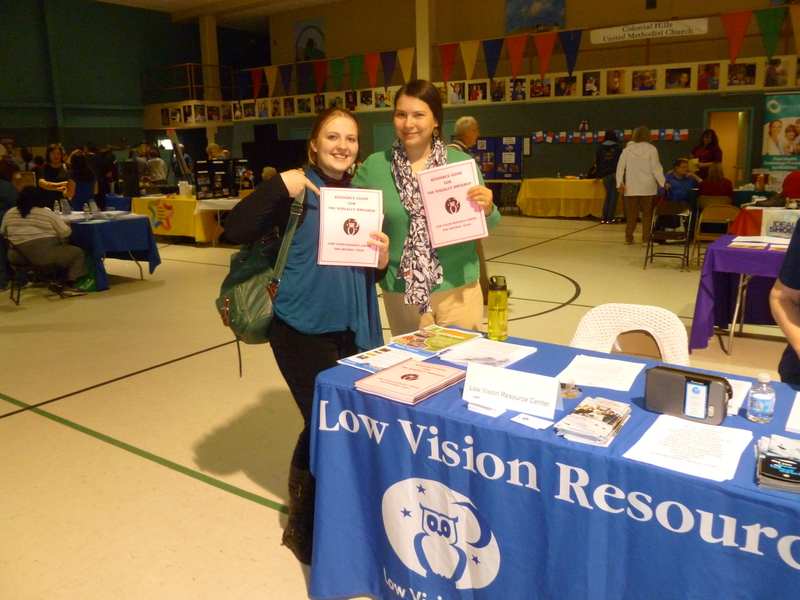 The volunteers consist of high school students, RSO Low Vision Club members and San Antonio Lighthouse of the Blind members. 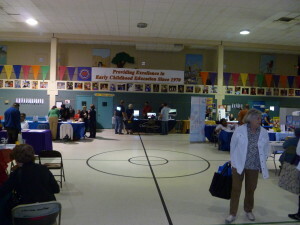 I really enjoy the Low Vision Expo because you can find the latest in low vision aids magnifiers, closed circuit TV’s, computers and other items. I had a lot of fun learning how to use these gadgets. Also there are community agency representatives who will answer questions concerning their services and products. 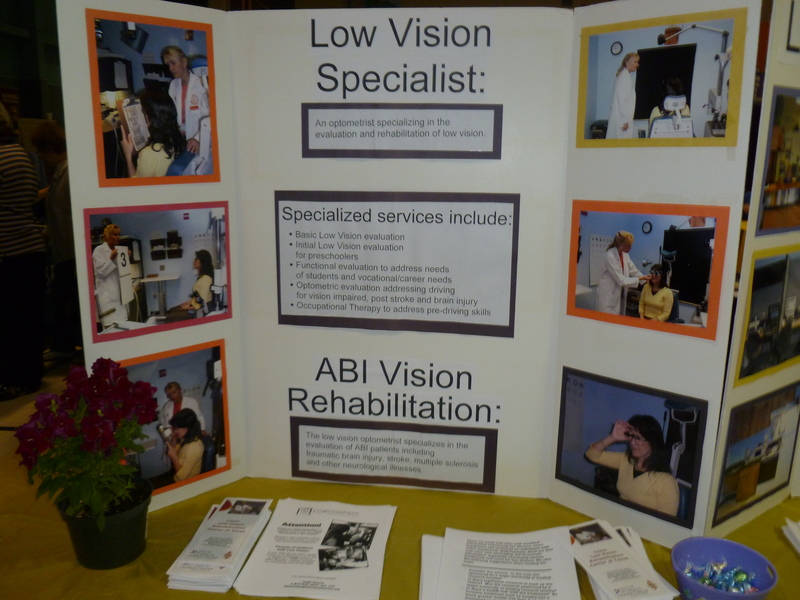 When I had some free time, I found myself talking to the representatives; it was a great learning experience because I learned more about the needs of low vision patients outside the exam room. 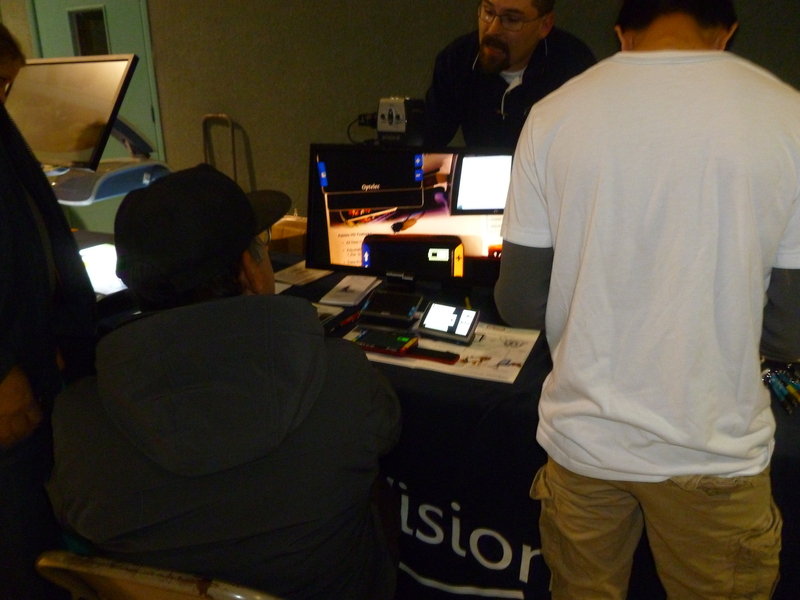 For example, there are companies that can come into your home and make it low vision friendly. There was also a free booklet compiled with Low Vision resources. Flipping through the pages, I’m glad to know that San Antonio is a Low Vision friendly place. 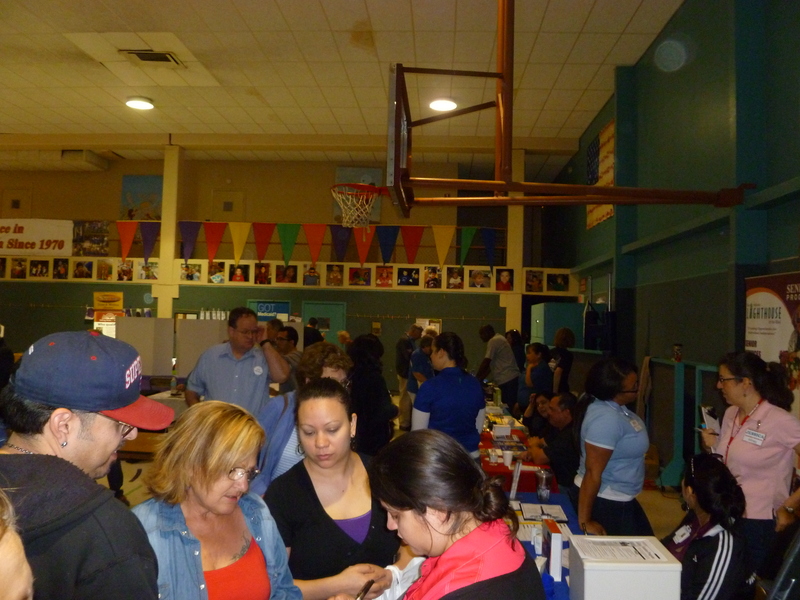 There were many vendors including our school: San Antonio Lighthouse for the Blind, Christal Vision, DARS (Division for Blind Services), Guide Dogs of Texas, HIMS Inc., San Antonio Eye Bank, Santa Rosa Low Vision Clinic, Texas Talking Book Program, Lions Low Vision Center, UIW Rosenberg School of Optometry, Via Metropolitan Transit with Buster their mascot, Low Vision Resource Center (Low Vision Club) and (Owl Radio) with Owl mascot and more community agencies.